Purple leaf plum trees stand in suburban yards and along urban streets across the United States and southeastern Canada. A native of Asia, it grows in most types of garden soil as long as it is well-drained. Its American range covers hardiness zones 9 to 4b—less with some varieties. Unfortunately, its short, lovely lifespan is plagued with insects and disease. 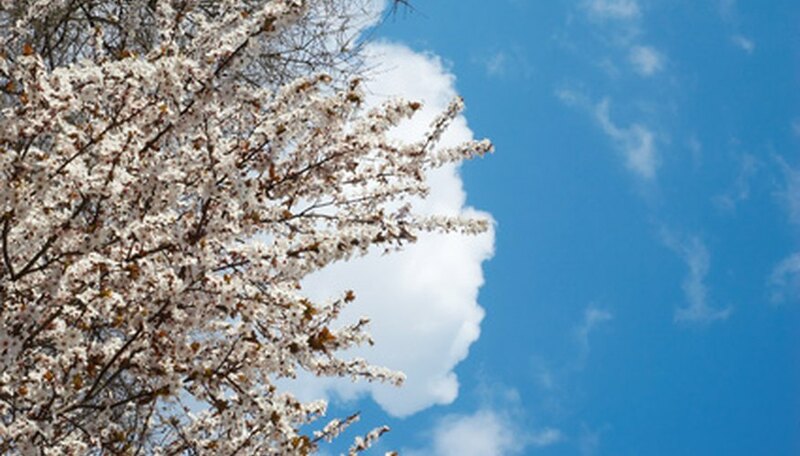 Prunus cerasifera is a small, deciduous tree that grows from 15 to 28 feet tall. Purple-leaved cultivars display rounded, spreading or columnar crowns with 1 1/2- to 2 1/2-inch-long oval leaves following white to pinkish-white flowers in spring. The purple leaves persist throughout the summer as 1-inch plums form. The University of Connecticut lists five major divisions of purple leaf plum. The original purple plum’s introduction to America dates to 1880; p. cerasifera “Atropurpurea” is also called a “Pissard plum.” P. cerasifera “Thundercloud” is a 20-foot-tall, upright tree with thick spring blossoms and deep purple foliage. A similar tree, p. cerasifera “Kruter Vesuvius” or “Vesuvius” is similar to Thundercloud but grows about 10 feet taller. P. cerasifera “Newport,” at 15 to 20 feet, survives New England and Canadian winters; its form is rounded rather than upright. P. cerasifera “Mt. St. Helens" is a more vigorous grower that reaches 20 feet tall and wide. Purple leaf plums propagate by seed or division. The University of Florida’s Environmental Horticulture department suggests stratification—storage of seed at 40 degrees Fahrenheit in a moist environment for three to four months. Germination occurs when daytime soil temperature reaches 86 degrees and falls no lower than 68 degrees. Purple plums also self-propagate by means of aggressive suckering, which takes place throughout their lives. The trees also grow readily from hardwood cuttings taken in early winter. The young tree’s trunk and branches start as a smooth reddish brown and turn gray with age. Trees begin to flower after one or two seasons of growth. As the tree matures, suckers grow from the base of the trunk; if they are not removed, growth slows in the upper parts of the tree. Suckers may form multiple trunks. After 10 to 15 years of life, even purple plums that have had plenty of water and sunshine will begin to decline. Often one trunk will die and a newly grown one will survive for several years past the typical 20-year lifespan of the tree. Death may be hastened by any of a number of problems, including heavy winds or heavy snowfalls that break brittle branches. Purple leaf plums are susceptible to a number of fungus diseases and pests that can weaken the tree and shorten its life. Black knot, brown rot and plum pockets are common fungus diseases. Pests include several clearwing borers and beetles, including Japanese beetles. Check with your local forester or agricultural extension to find out what problems plague purple plums in your area. Missouri Botanical Gardens: Prunus cerasifera "Thundercloud"